Representative Hank Johnson and 43 representatives have reintroduced the Berta Cáceres Human Rights in Honduras Act, H.R. 1945, in the current legislative session of the House of Representatives. The bill would suspend US military and security aid to Honduras until important human rights conditions are met, including justice for the murder of Berta Cáceres, the killings of over 100 small farmers in the Aguan Valley, the murders of demonstrators who were killed by security forces while opposing election fraud last year, and more. Take action: Is your representative a co-sponsor of the bill? Click here to see a list of co-sponsors. If your Representative is not a co-sponsor, please call the Congressional Switchboard – 202-224-3121- and ask for your Representative’s office, and then the foreign policy aide. Explain that you are extremely concerned about the human rights situation in Honduras, including the murders of over dozens of people by Honduran security forces during pro-democracy protests last year, the murder of Indigenous leader Berta Caceres, and the ongoing repression of Honduran civil society by US-funded and trained security forces. 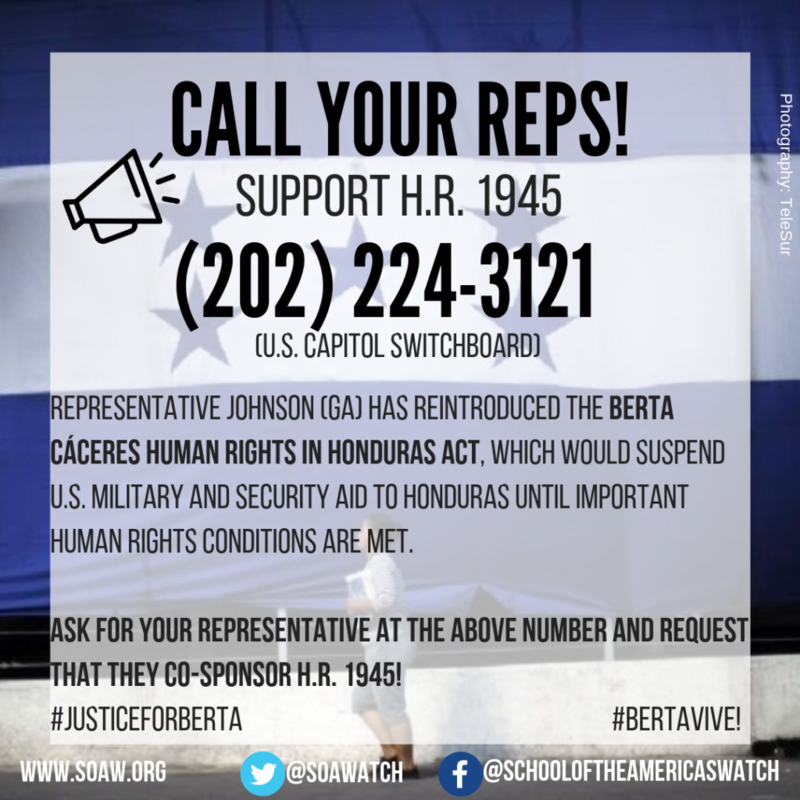 Ask that the staffer request your Representative co-sponsor HR 1945, the Berta Caceres Human Rights in Honduras Act, and to let you know when they decide to do so. If you get a positive response, please let us know! If your Representative is already is a co-sponsor, you can call to thank them for co-sponsoring the bill and ask them to continue to support efforts to stop US support for the repressive Honduran regime. Call the Congressional Switchboard at 202-224-3121 to ask for the office of your Representative. If you have questions about finding your Representative or if he/she is a co-sponsor, please reply to this e-mail. You may have heard on the news that Trump wants to cut US funding to Central America and wonder how that relates to the need for the Berta Cáceres Human Rights in Honduras Act. SOAW has consistently opposed the Alliance for Prosperity, which was the massive ‘aid’ package for Central America modeled after the disastrous Plan Colombia. US ‘aid’ to Central America serves US interests by giving the US leverage and control and promotes a false notion of ‘development’ that is often the imposition of neoliberal economic policies. However, demanding governments physically block their citizens from fleeing for their lives in order to receive money from the US only incentivizes further repression and violence. Congress should end financial and political support of the Honduran and Guatemalan governments, not until governments stop people who are fleeing for their lives, but until government repression against civilians, especially widespread murders of social movement and community leaders who are standing up for their rights, ceases. Furthermore, what hasn’t been in the news is that Trump’s Fiscal Year 2020 Budget for the Department of Defense includes enormous increases in funding for ‘security cooperation’ programs run by the US Southern Command, which includes Central America. In fact, ‘security cooperation’ for the US Southern Command increases in the President’s budget from $38 million in 2019 to $208 million in 2020. The US Southern Command covers Central and South America as well as the Caribbean, making this enormous increase in military funding an ominous sign for the whole region. If the US really wants to stop migration from Central America, it needs to stop pushing neoliberal and extractive policies, stop backing coups and repressive regimes, and let the people of Central America decide their own futures. The US itself bears enormous responsibility for people fleeing for their lives from Central America, given decades of destructive US policies in the region. Most recently, it was the United States that ensured Juan Orlando Hernandez was installed for a second term as president of Honduras, despite massive demonstrations across Honduras and such obvious electoral fraud that even the OAS initially called for the elections to be repeated. The Berta Cáceres Human Rights Act is still as urgent as ever. It is an important first step because it would end US funding of the Honduran military and security forces precisely because of widespread repression. It would result in a Congressional suspension of funding — regardless of the whims of the president — until the military and other security forces cease repression, until there is justice for the victims, and other important human rights conditions.